Find out everything about our new Premium movement here. 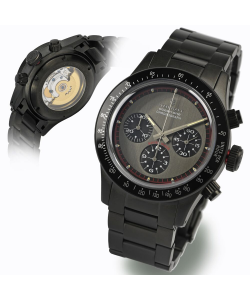 The most striking feature of the "STEINHART Ocean One Vintage Chronograph black DLC" is probably its dial. grey metallic with contrasting sub dials and inner ring with fine, red accents, surmounted by a high domed sapphire crystal with a double layer of anti-reflective coating on its inside. Framed is this breathtaking sight by a black aluminum inlay with tachymeter scale, which, in conjunction with the chronograph complication, can be used for measuring velocities. 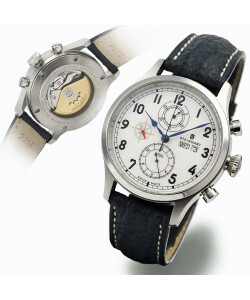 The "STEINHART Ocean One Vintage Chronograph black DLC" is powered by the Dubois Dépraz DD 2020, a Swiss automatic movement which is based on the decorated ETA 2824-2 TOP with its gilded STEINHART rotor, which can all be admired through the sapphire crystal window in the screw-down stainless steel case back. Also screwed down is the large, well gripping crown with its discreet red accent as well as the two pushers, which allows for a water resistance of up to 10 ATM. Irrespective of these technical highlights, the look of this Chrono with its partially black matt stainless steel case radiates the irresistible flair of the wild 60s. Whether you wear the "STEINHART Ocean One Vintage Chronograph black DLC" on the matt black bracelet, that tapers down to 18mm towards the folding buckle, or on a leather or synthetic watch strap, the sporty charme of this watch will be difficult to resist. The most striking feature of the "STEINHART Ocean One Vintage Chronograph black DLC" is probably its dial. silver metallic with contrasting sub dials and inner ring with fine, red accents, surmounted by a high domed sapphire crystal with a double layer of anti-reflective coating on its inside. Framed is this breathtaking sight by a black aluminum inlay with tachymeter scale, which, in conjunction with the chronograph complication, can be used for measuring velocities. The "STEINHART Ocean One Vintage Chronograph black DLC" is powered by the Dubois Dépraz DD 2020, a Swiss automatic movement which is based on the decorated ETA 2824-2 TOP with its gilded STEINHART rotor, which can all be admired through the sapphire crystal window in the screw-down stainless steel case back. Also screwed down is the large, well gripping crown with its discreet red accent as well as the two pushers, which allows for a water resistance of up to 10 ATM. 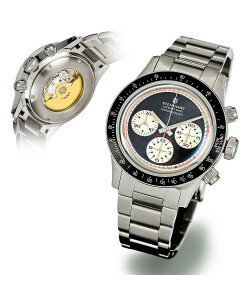 The most striking feature of the STEINHART Ocean One Vintage Chronograph is probably its dial. Ivory with contrasting sub dials and inner ring with fine, red accents, surmounted by a high domed sapphire crystal with a double layer of anti-reflective coating on its inside. Framed is this breathtaking sight by a black aluminum inlay with tachymeter scale, which, in conjunction with the chronograph complication, can be used for measuring velocities. 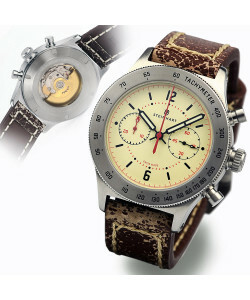 The STEINHART Ocean One Vintage Chronograph is powered by the Dubois Dépraz DD 2020, a Swiss automatic movement which is based on the decorated ETA 2824-2 TOP with its gilded STEINHART rotor, which can all be admired through the sapphire crystal window in the screw-down stainless steel case back. Also screwed down is the large, well gripping crown with its discreet red accent as well as the two pushers, which allows for a water resistance of up to 10 ATM. This pilot watch" Nav.B Chrono 47mm Gray Edition Premium" is another chronograph from the house of STEINHART with the well-tried "ETA VALJOUX 7750 premium" automatic. The beautifully crafted, matte gray stainless steel case with the large "historic" crown completes the family of Nav.B watches. This "Nav. B-Chrono 47 mm Gray Edition Premium" makes every clock fan's heart beat faster. The domed sapphire crystal, which is double-coated from the inside, and the dial with white hands give this pilot's watch an incomparable appearance. 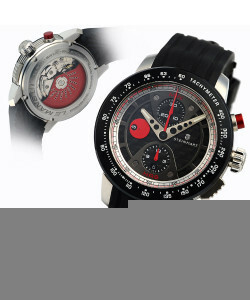 Particularly noteworthy is the design of the dial. It was modeled on the typical Nav B -Uhr, model "B-Typ". The Steinhart Apollon Chronograph is our innovative new sports model, which leaves very little left to be desired: large titanium case, domed sapphire crystal, sandwich dial, Swiss automatic movement ETA 7750, water resistant to 10 ATM etc. In addition, the 24 mm lugs that make use of our easy and safe to handle screw bar system, offer the possibility of a wide variety of different looks to the watch by quickly being able to change the strap. By supplying two additional exchange bezels, which can be replaced just as easily, safely and quickly, these possibilties have now grown to infinity, so that the Steinhart Apollon Chronograph can simply never be boring. 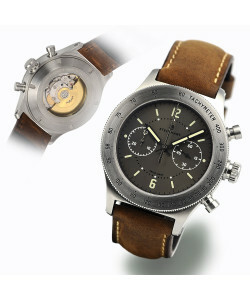 Be it timeless using the brushed stainless steel bezel, strongly contrasting when the black, DLC-coated bezel is mounted, or elegantly precious when sporting the naturally aging full bronze bezel ­with the acquisition of a Steinhart Apollon Chronograph you will always have the right watch on your wrist. Rubber strap also available ! The so-called '24 heures du Mans' have been held near the French town of Le Mans since 1923. These 24-hour endurance races have always been the yearly testing point for car manufacturers from around the world to prove their level of development and the reliability of their vehicles. The new Steinhart Le Mans GT Chronograph pays tribute to the daring drivers and their technological marvels of this legendary racing series and also to show how the STEINHART brand has further evolved since its inception. The bold design of the watch simply screams motor sports: the dual-layer dial which makes use of genuine carbon fiber, the black bezel with the Tachymeter scale for measuring speed, the hour and minute hand reminiscent of historical sports steering wheels, the second hand in the shape of a speedometer needle, plus the red chrono pusher, which starts the stop watch function like the start button of a Gran Turismo starts its powerful engine. Inside the STEINHART Le Mans GT works precise Swiss mechanics, protected by an elaborately designed case, which is held securely on the wrist by a rubber strap - not only of race drivers. 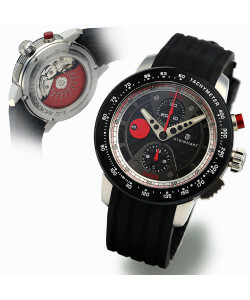 Even someone who is not a motor sports fan, is sure to devote more than just a glimpse to this highly detailed watch! In the 18th Century, the carpenter John Harrison developed on behalf of the British government a precision instrument for accurate determination of longitude at sea, the first marine chronometer. These high-precision chronometers, gimbal mounted in wooden boxes where mainly built for the Navy in Hamburg, Kiel and Glashütte. They where used on many marine vessels until the invention of the quartz movement and are highly collectable items today. As a tribute to the craft and to be able to enjoy looking at this classic design on the wrist, STEINHART has developed the Marine Chronograph 44.. Powered by a precisely working Swiss automatic movement with chronograph complication, stored in a brushed stainless steel case, one can admire the stunning technology of this instrument throught the exhibition case back at any time. Under the domed, double-coated sapphire crystal of the front one is immediately captured by the timeless classic look of the old marine chronometers, complemented by date and weekday display as well as the running second at 9 clock in the form of a discreet compass rose combined with a two colored compass needle - another tribute to the services at sea from days gone by before satellites and GPS. Stylishly secured to the wrist by a shark leather strap in dark blue, which complements the iridescent color of the hands gorgeously, the STEINHART Marine Chronograph 44 is an elegant and accurate companion that should be part of every watch collection. 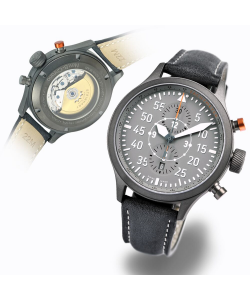 The Marine-Officer Grey is a modern interpretation of an observer chronograph that was developed towards the end of World War II for deck officers of the Italian Navy. The wide bezel of the finely brushed stainless steel case provides sufficient space for the engraved tachymeter scale, which can be used in conjunction with the chronograph to determine the speed of moving objects. The reduced light grey dial ensures good readability, which is also given in darkness due to the indices and black hands being painted with C3 Superluminova. Our Marine-Officer Grey is powered by a wonderfully decorated Swiss chronograph module caliber, the Dubois Dépraz DD 2030 which is automatically wound by our skeletonized gold rotor. 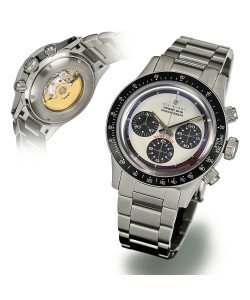 This process can be observed through the stainless steel encased glass case back by gently shaking the watch. The Marine-Officer is a real eye catcher, and not only on the high seas a MUST-HAVE for ever watch-enthusiast and -collector !